There was a time when the gadgets of science fiction were just the imaginings of inventive authors. But, if history has taught us anything it is that fiction predates fact. Engineers and inventors regularly take to the drawing board to bring to life the far- fetched technology of the future. You can thank sci-fi loving nerds for flat screen televisions, virtual reality, and smart phones. The modern home of the 21st century is increasingly filled with items that were once the realm of the Jetsons or the starship Enterprise and the Smart Home is the trend of the future. The Roomba has been on the market for several years now, terrifying countless domestic cats. It was among the first domestic robots to become mainstream. Samsung introduced a competing smart vaccum, the the Powerbot, in Europe in 2014. It's due to hit American shelves in 2015, with a host of features to set it apart. But, now smart technology is being applied to everything from door locks to ovens. 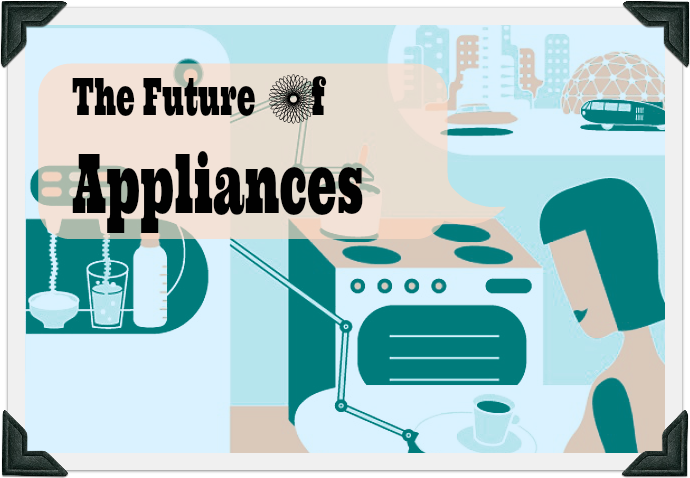 GE, LG, and Whirlpool are rolling out appliances in 2015 that you can control via your smart phone; with Whirlpool promising to make every one of its new appliances smart this year. In an age when our phones are our means of connecting with the world, products with Wi-Fi capability will be controllable from a distance.A new water heater is coming from GE in early 2015 that can be adjusted via an app. Coming later in the year are ovens and ranges that can be pre-programmed and turned on or off from your phone, with features to monitor cooking and alert you when the food is done. The new connected washer and dryer allows you to control temperature remotely, and warns you when wrinkles are about to set in from a load left to sit too long. The connected refrigerator tells you when the door is left open, the temperature is too high or if you need to change the water filter. You can also check if there is ice and tell the freezer to start making some if not. Connected dishwashers will tell you when food is clogging the drain, and monitor the cleaning process to make sure dishes come out consistently spotless. Nest, a Google subsidiary, currently produces a smart thermostat and smoke detector. Nest is also the name of a hub the company developed to connect all of the smart aspects of your home. Most producers of smart and digital appliances are producing apps to connect those devices to your smart phone. If you have a home with nothing but appliances from one brand this is fine, otherwise you're juggling multiple apps. Nest, on the other hand, unites the various controls into a single app, that not only handles smart appliances, but can allow you to control the locks, lights, and any other connected feature in your home. You can use Nest in your car to turn up the heat in your house before you get home. Or use it to lock the doors, or turn off lights if you forgot. Apple is working on something similar, and recently unveiled a smart plug. The plug allows non-connected devices (such as a lamp or television) to also be controlled via your phone. While smart houses are impressive, the market is a little divided between appliances that help you live better and perform household tasks more efficiently, to actual robots that do the chores for you. Like Roomba and Powerbot, a number of robots are hitting the market to do everything from water your plants to cleaning your pool. There are even robots designed to serve as a virtual avatar., allowing you to attend a meeting in Hong Kong and tour a facility, from your office in New York or wherever. The robot enables you to interact in real-time and move about the space, rather than being trapped on a computer screen via Skype or Google Hangout. For those of us who want our own version of Rosie, the Jetsons' sassy robot maid, there's Robot Butler. The Robot Butler is a life-size android that's already available for pre-order and is being shipped for in-home beta-testing. He walks, he talks, he learns. He also has a touch screen interface in his chest and can follow commands. He learns your habits, and anticipates your needs. This may sound like the precursor to the robot uprising, but it's also the direction we're moving in as technology becomes an increasingly more vital part of our everyday lives. Whether you want a robotic servant to bring you hot towels, or just an oven that will warn you when the roast is about to burn, smart appliances are here, and there's something for just about every budget.